When the goats arrived it became very clear what hay wasters they are. 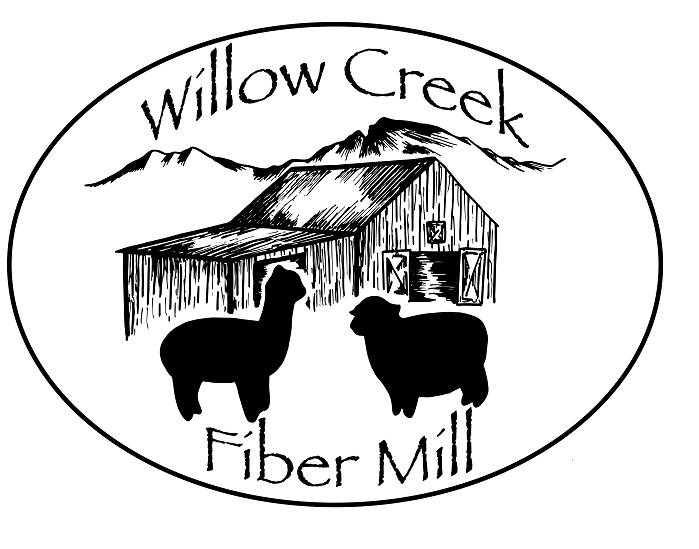 We built some hay racks for inside the barn that would help decrease the waste – you can see those by clicking here. 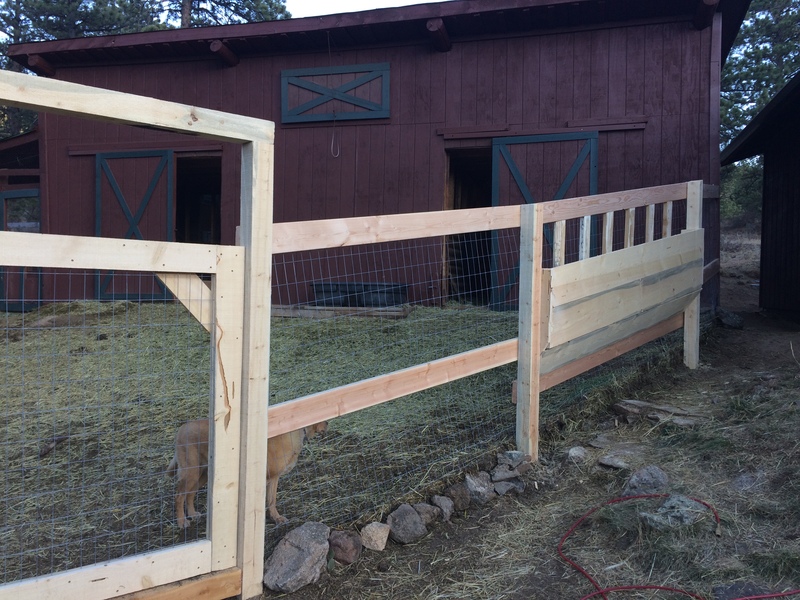 But we needed something for when they are eating outside in the barnyard. 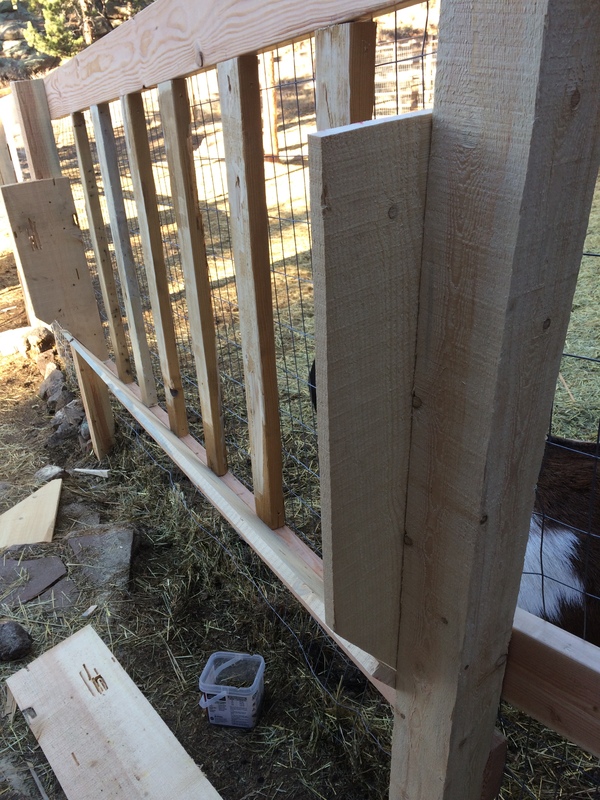 We could have made the same feeders and just hooked them to the fence, but we saw some ideas online and decided to do a feeder that would be built in to the fence and could accommodate all of our goats, sheep, and their young. 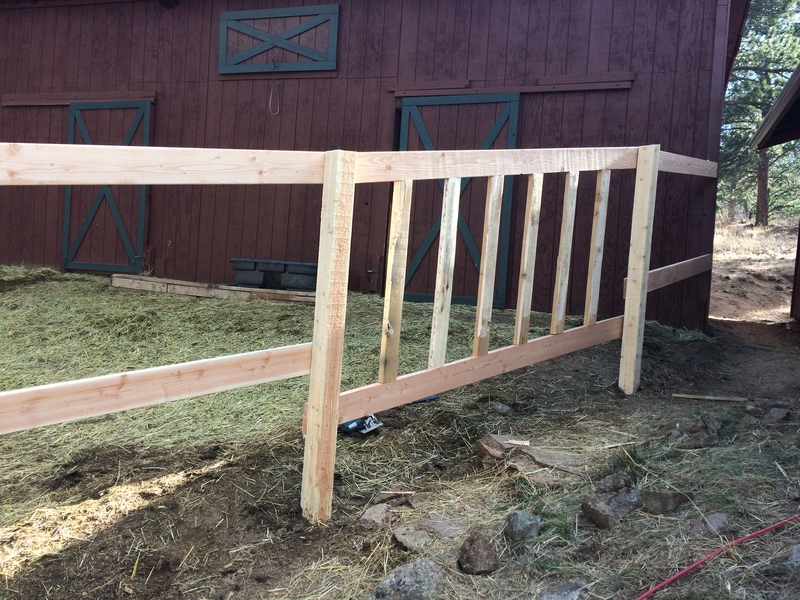 We were already planning to replace a section of our horse panel fence with new permanent fence, so we did the manger build-in at the same time as building the fence. First, we picked which section of fencing would have the feeder. Each section is 8 feet long. 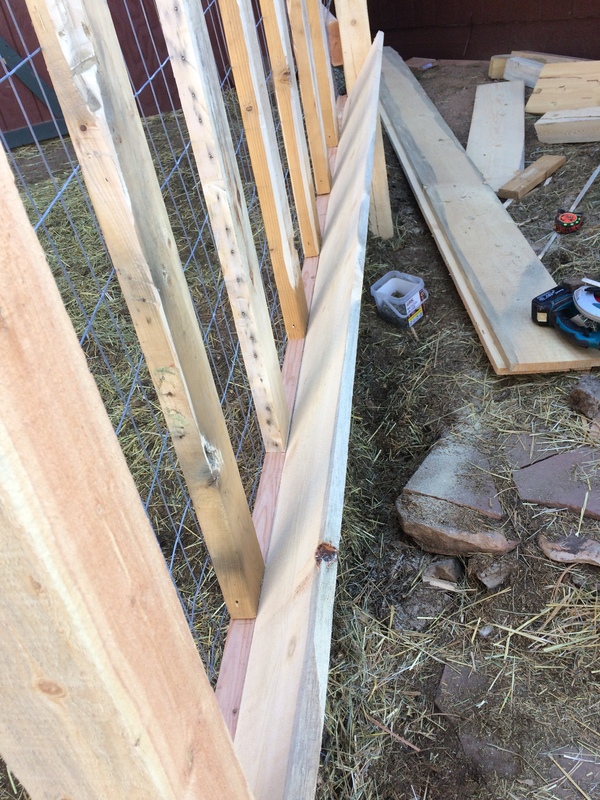 In the feeder section we put the bottom rail lower than the rest of the fence, at about 24 inches off the ground. 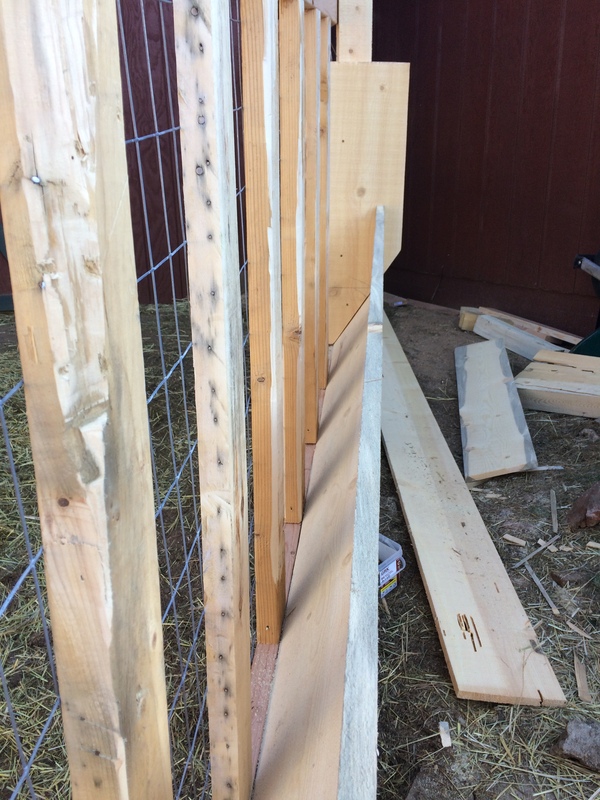 Then we put upright 2x4s every 13 inches to help support the wire since we were unable to get the thicker gauge wire we originally wanted. 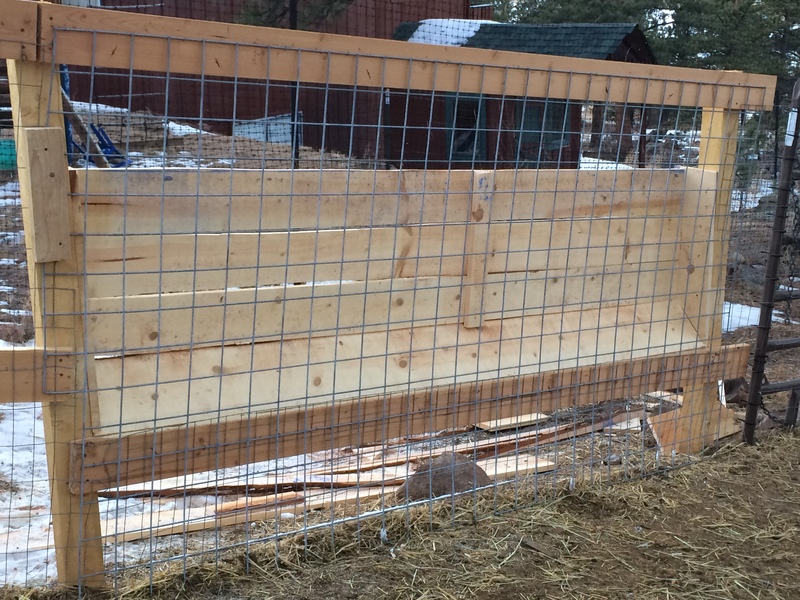 Then we attached the wire to the inside of entire fence, including over the feeder section. Next, we used rough sawn 1×10 to build the box. The bottom piece was slanted. Then we used 1×10 to make the end pieces. Then we put the second 1×10 on, this one vertical instead of slanted. It was 7 inches from the wire to the board. 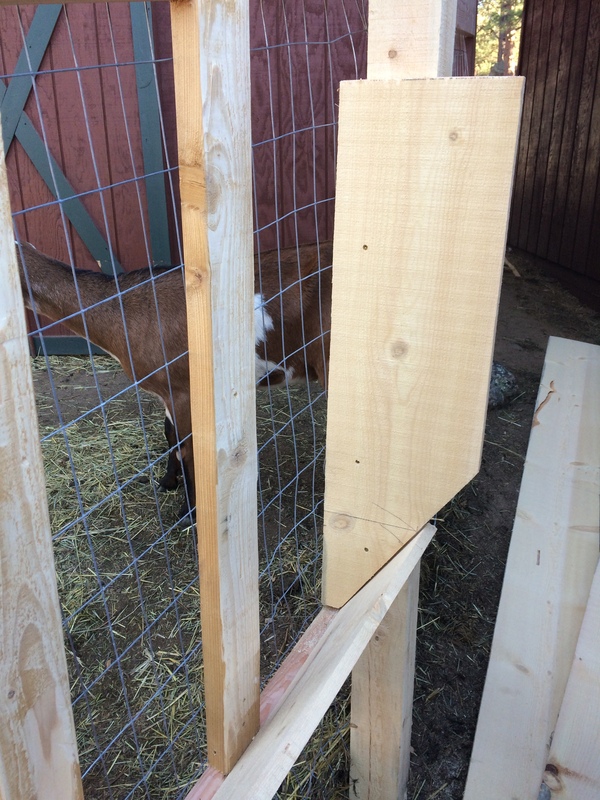 Once we got that piece on, we realized a center support would be helpful in really making the feeder strong. Then we put on the last 1×10, still 7 inches from the wire. Lastly, we cut the end pieces square with the box so it all looked nice. And that is it! 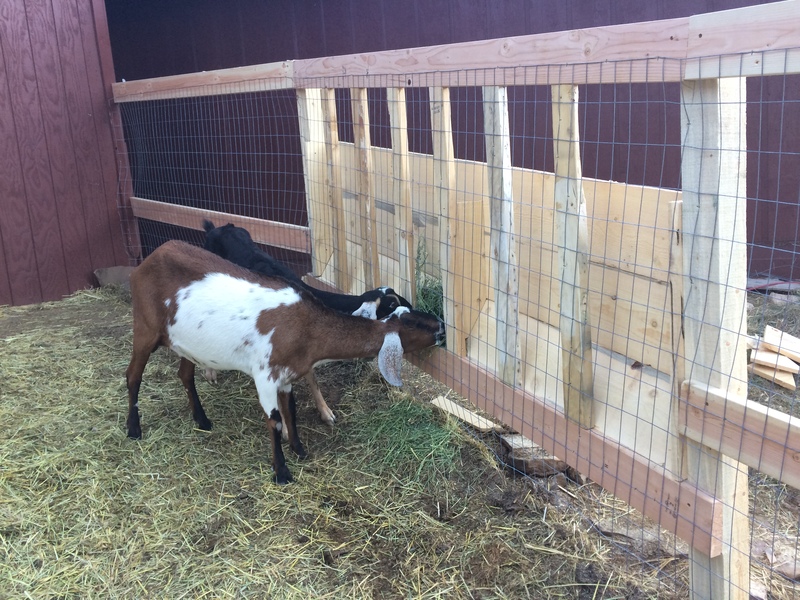 We put a little snack in it to see how it worked for the goats and it worked well. 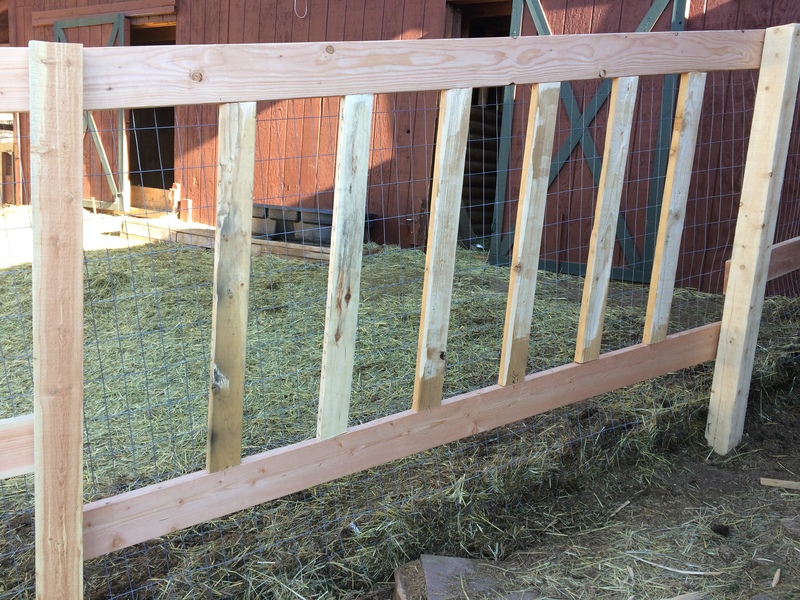 It is wonderful to have a nice manger for the goats and sheep that will keep their food off the ground and prevent waste. 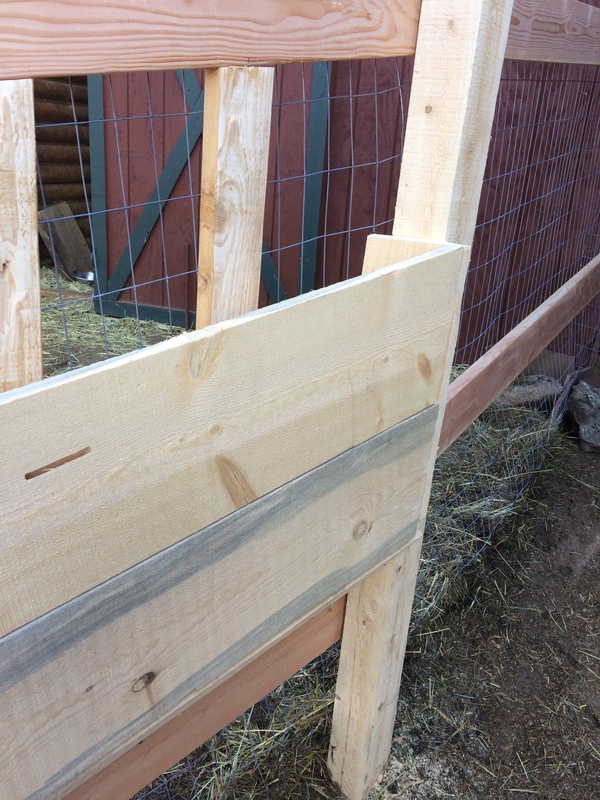 Our indoor goat and sheep hay feeders were working so well we felt the design of the fence one would be just as good. 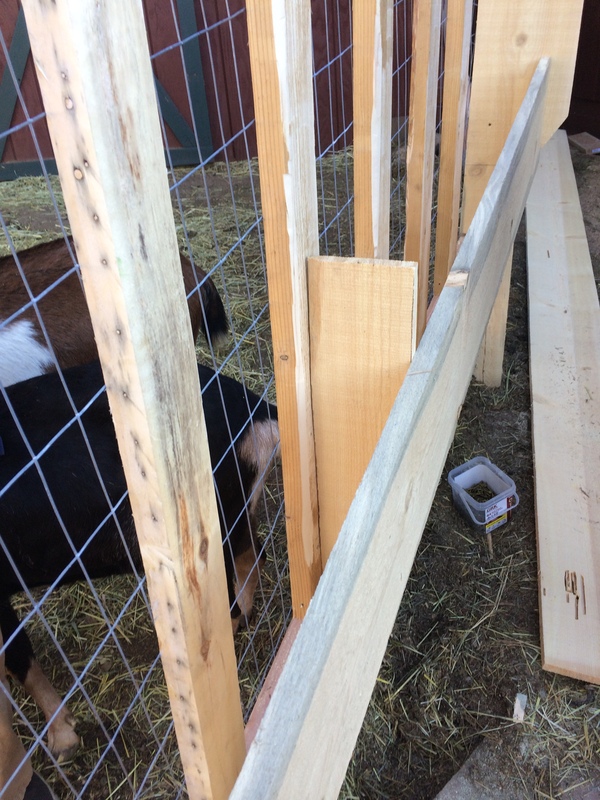 But we noticed right away that the goats were not able to get all the hay. 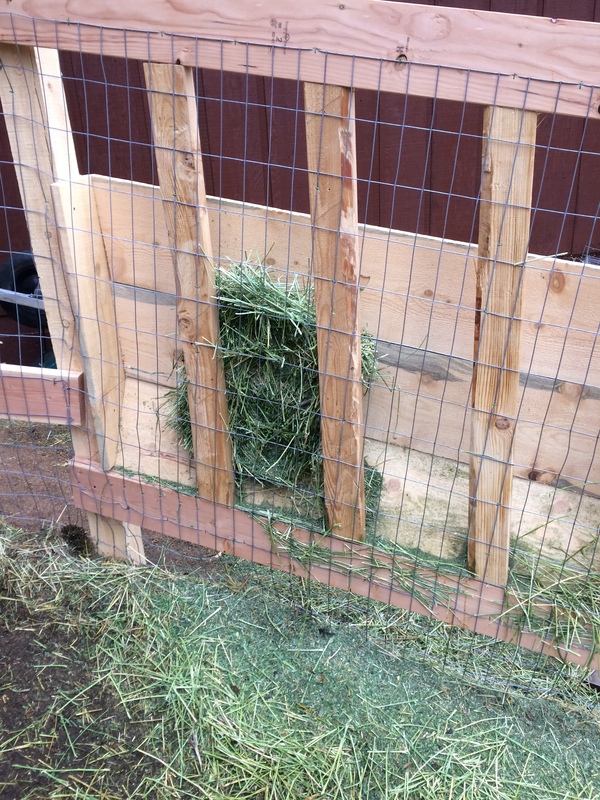 We found almost full leaves of hay still in it when they were done eating. 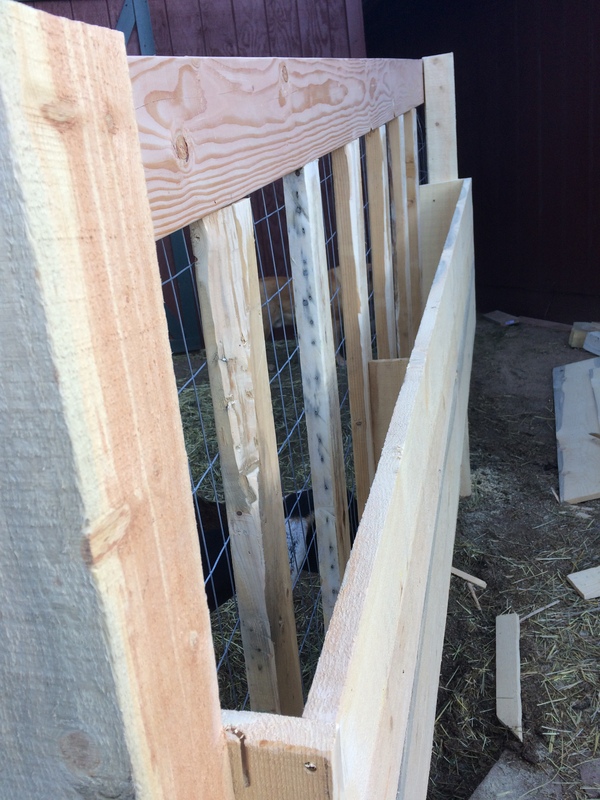 At first it seemed the problem was that their Nubian noses couldn’t fit through the holes far enough to reach the hay. 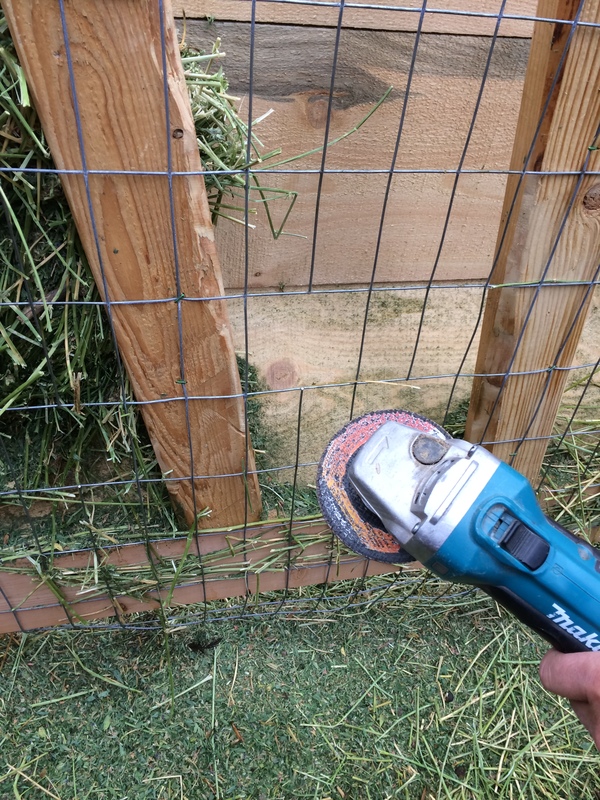 So, using his angle grinding tool, Mtn Man cut out some of the wire to make bigger holes and sanded the cut edges smooth. This helped a little, but they were still having trouble. 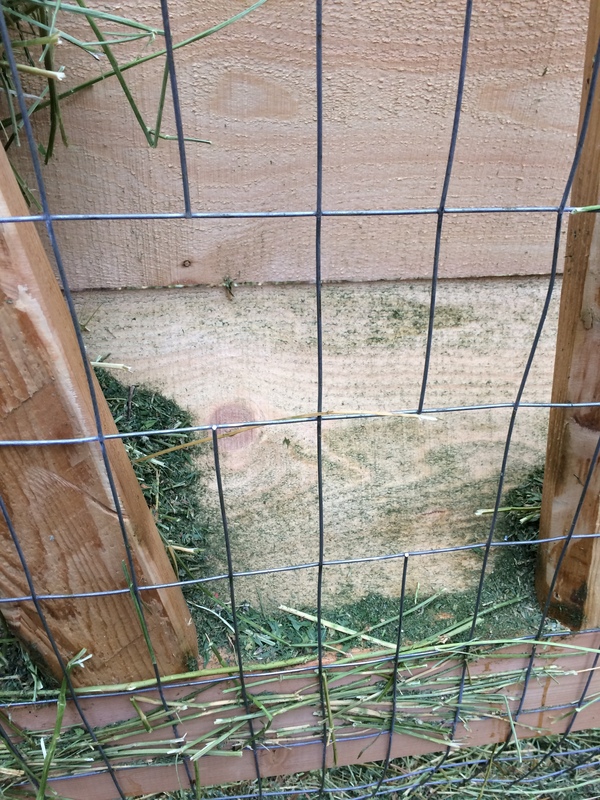 The hay wasn’t sliding down as easily against the wood back as it did against the plastic back of the indoor ones. 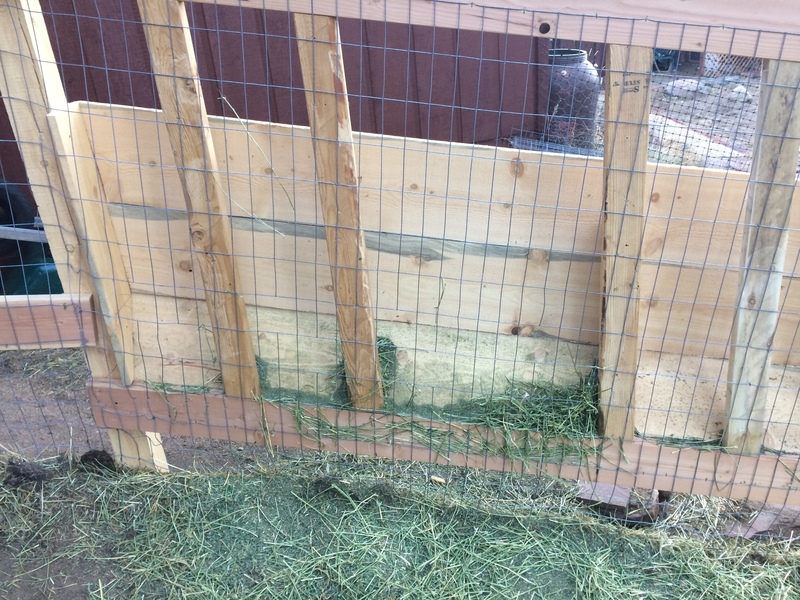 Mtn Man decided that the support slats were too close together and that we needed to remove every-other one to help the hay slide down better. He started by just removing one to see if it would work. Sure enough, the next day after they ate there were only crumbs left. 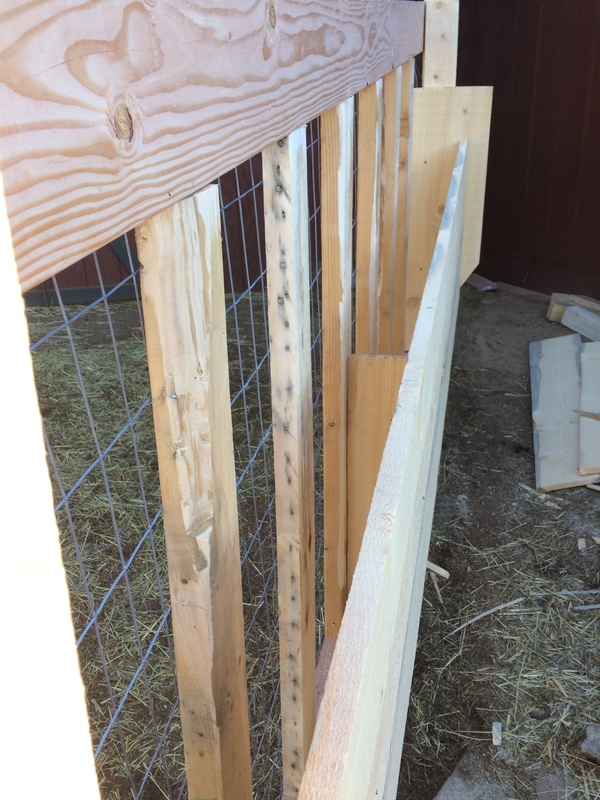 So then he removed the others, and made some more of the bigger holes in the wire. 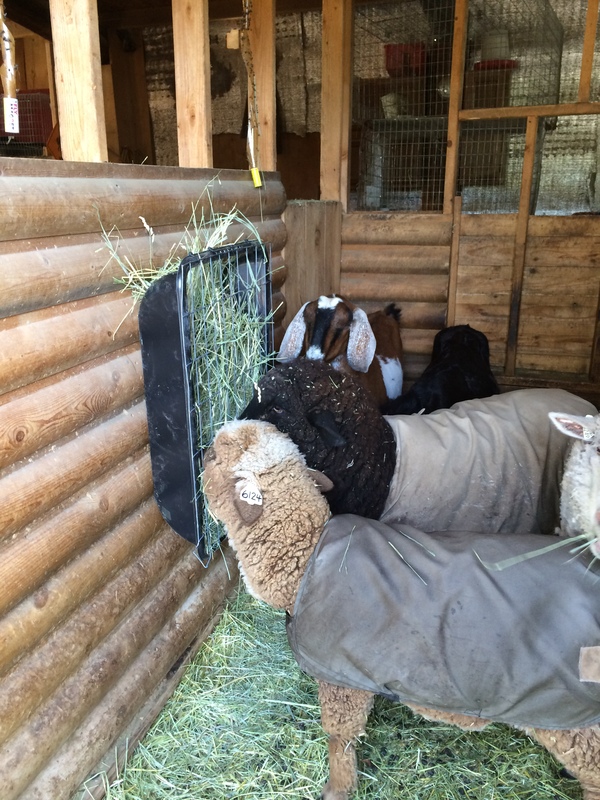 The combination of the two made the manger work much better and now they are eating happily. 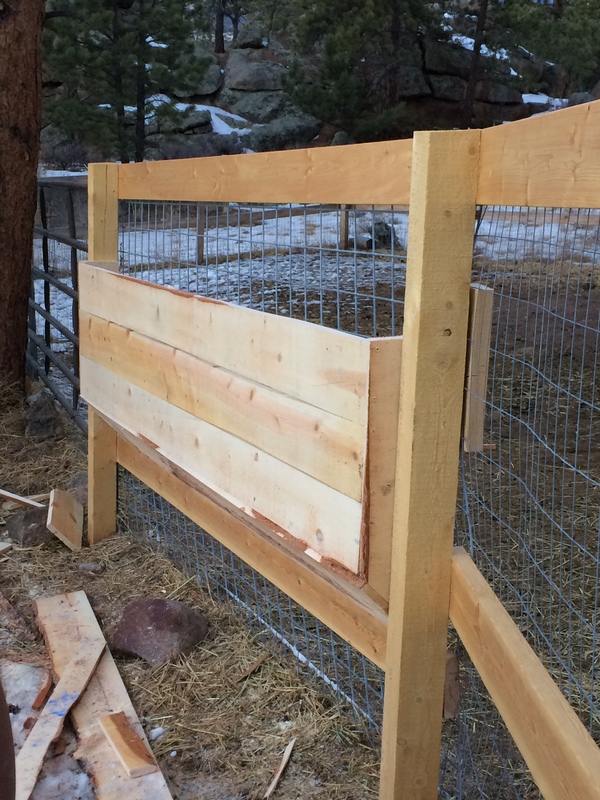 We built a second fence feeder so that we would have enough feeding space for all the sheep and goats, along with their babies come this spring. 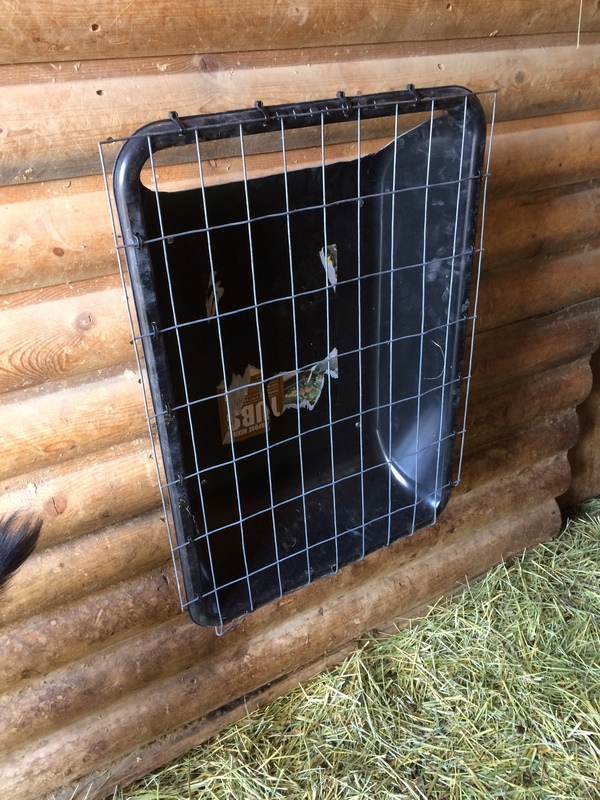 This time we were able to use a livestock panel with 4×4 inch holes and thicker gauge wire. It worked MUCH better. We didn’t even need the vertical wood supports. 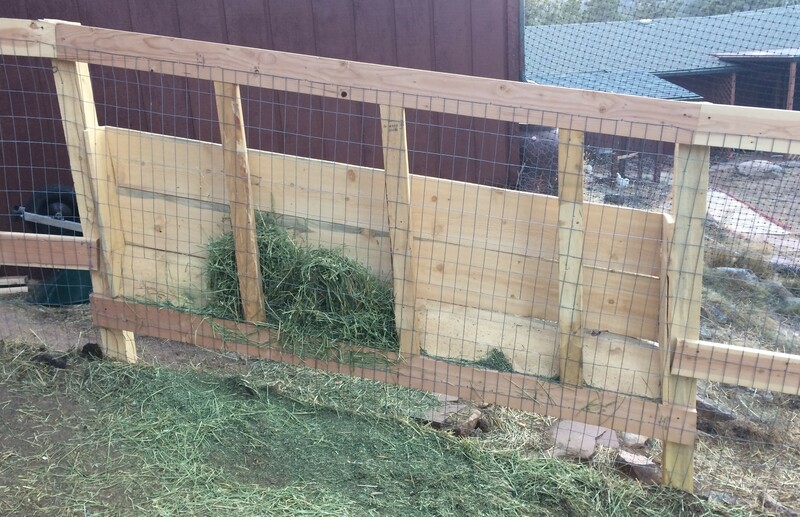 The original feeder was 8 feet long, the new one is 9 feet long (just because of the variation we needed in our fence sections) – between the two there is plenty of space for our 7 sheep and goats to eat, as well as space for more once the babies arrive. 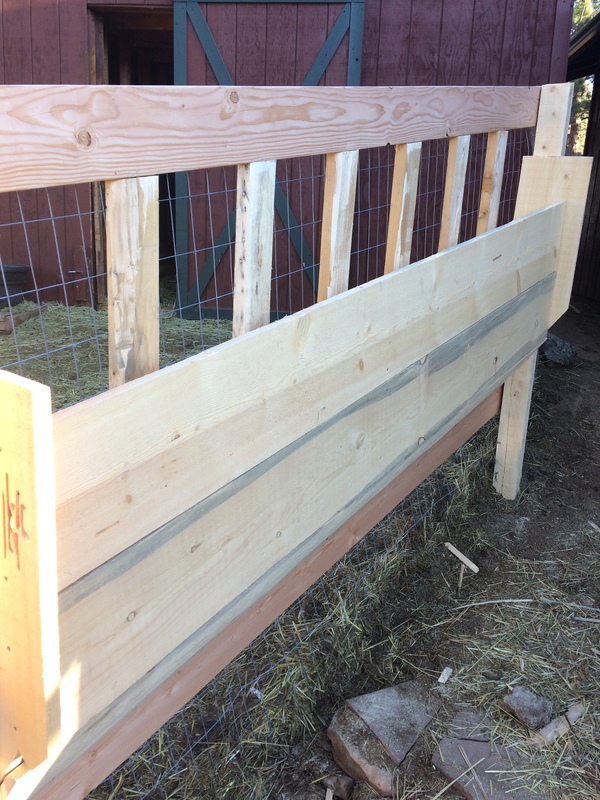 Nice job-one little hint but it depends on what type of hay you use…we use alfalfa n put a trough under the bunk to catch the goodies that fall through. The trough is easily removed for cleaning. Great set up you did! Thanks for the hint. 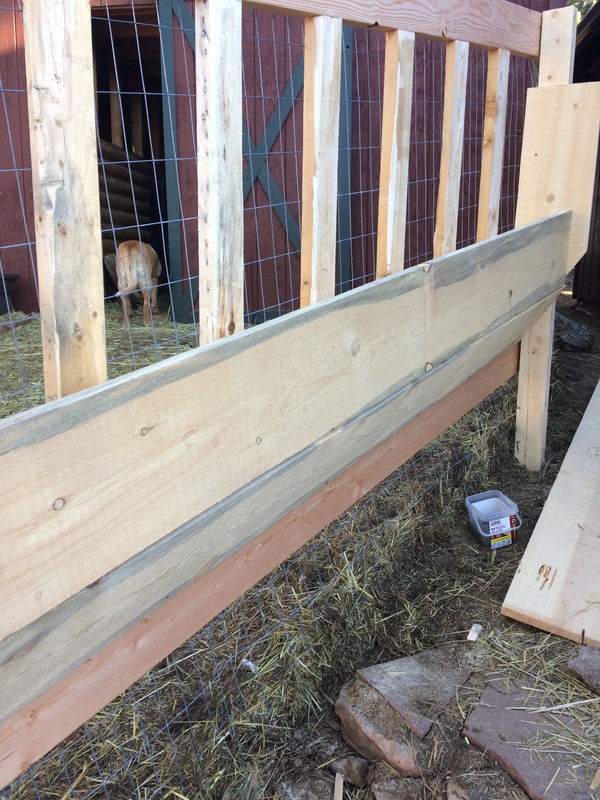 We have noticed the crumbs falling through and so far the goats have been happily eating them off the ground, but a trough could be a nice addition in the future. 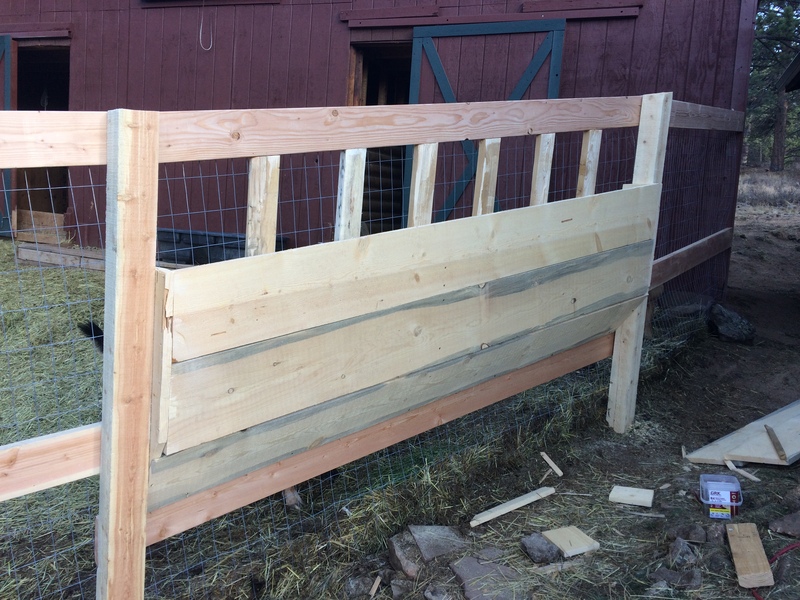 Love it, I was just talking to hubby about making a fence feeder area for the sheep to help prevent waste.. mine will be a touch different but same idea.. great overview and I will show hubby how you did yours! Please post it so we can see it when you are done!